Hey guys.. these were my weekend nails. I did them on Thursday, but just took pics today, so forgive any wear and tear on them after a few days of cooking, cleaning, and going to the lake! I was pretty tired, so I decided to rehash something simple.. 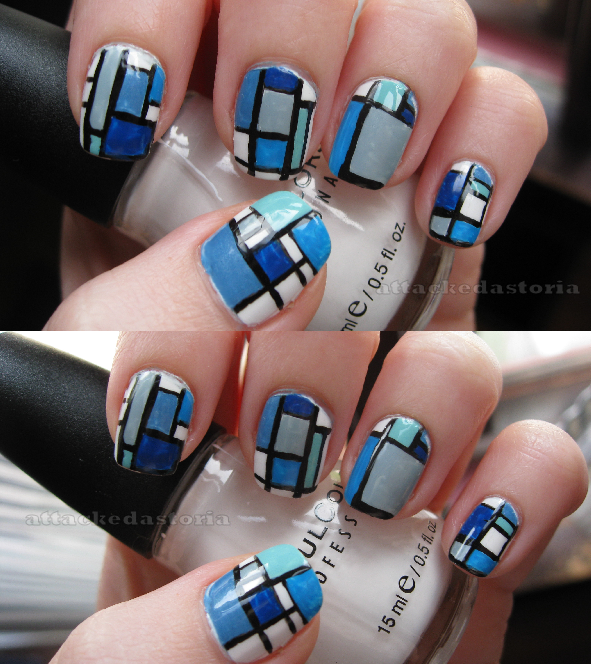 I just took the Piet Mondrian design I did previously, and used shades of blue instead of blue/yellow/red to do the color blocking this time. I am all about easy these days, haha. I might do this design again for a party next month since it matches the dress I'm planning to wear.. when in doubt, color block. Seriously. Awesome! I love how you chose to do different shades of blue. This is so fabulous. Gold star and a big thumbs up!!! Oooo, I love this. So pretty!